Croquet, Hurlingham Club, 1980. © Dmitri Kasterine. This week, The London Column is featuring the work of Dmitri Kasterine. Before leaving London for New York thirty years ago, Kasterine was a sympathetic and perceptive commentator on the English scene: his portraits of artists and writers (including Samuel Beckett, Graham Greene, Tom Stoppard, etc.) are familiar and definitive images for posterity – and his social documentary work, which we are showing, is impeccably witty and elegant. 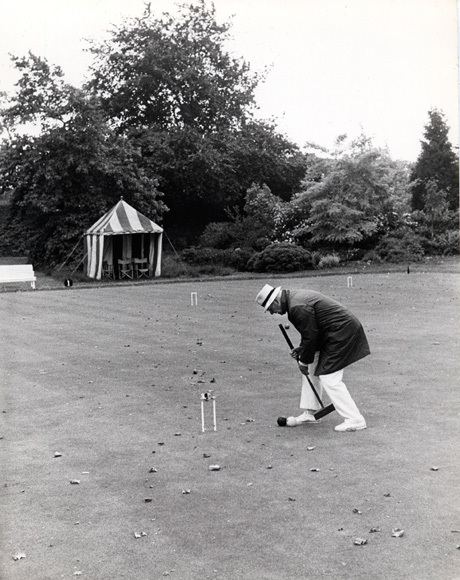 In this photograph, we see a croquet player in a shortie raincoat (clothes are important in Kasterine’s pictures) braving inclement weather to play against – whom? The field is empty, autumn leaves strewn across the lawn; summer is over, the spectators have left, hours or possibly days earlier. His grip on the mallet is assured yet faintly desperate. He is playing against himself and no-one cares – except the photographer. This is croquet transformed into an existential game – or, perhaps, a nightmare from an H.M. Bateman cartoon: The Man Who Played Croquet After the Pleasure Garden Had Shut. D.S.